The Bill Quinn Radio Hour X2! Ted Brown attended Roanoke College in Salem,Va. He got his first taste of broadcasting at a college dance when the master of ceremonies failed to show up and he filled in. After college he joined the United States Army Air Force during World War II. He was a tail gunner in a B-17 bomber. He was shot down over Germanyand spent 18 months as a prisoner of war. Got a smile on my puss, not a frown. Ted broadcasted with WNEW in the early 1950′s, during what was considered the golden age of AM radio when melody and lyrics still mattered in popular music. Upon his exit from WNEW to WMGM, station manager Bernice Judis commented “Don’t ever let him in the door again”. Ted Left WNEW in the early 1950’s, but would return triumphantly to WNEW in the late 1970’s. Back at WNEW he served as the afternoon drive air personality. He moved to mornings in 1978. When WNEW began evolving in 1979 from Adult Contemporary to Adult Standards/Big Bands in 1981, Ted was in his element playing Sinatra, Nat King Cole and Duke Ellington. 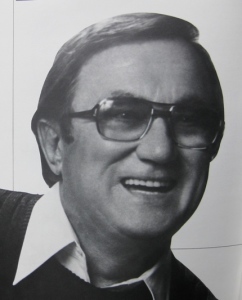 Ted continued working at WNEW until 1989 when he shifted to semi-retirement. In the 1990s he helped host the New York Giants football games on WNEW. Ted Brown loved the microphone and his fans loved him. He loved the Giants. More importantly he always reminded his listeners that he loved “Kids and Dogs and People”. He also shared his love for his family, he loved his wife Renee and often played her favorite song–”Satin Doll”–and he really loved his daughters Jamie and Sam, entertaining listeners with their home phone calls. Metromedia Radio® is a registered trademark with the USTPO serial number 85252322, Double You Enny Double You, Eleven Three Oh In New York® is a registered trademark with the USTPO serial number 85265305, Anytime Anyplace N E W® is a registered trademark with the USTPO serial number 85252492, New Radio 1130 New York® is a registered trademark with the USTPO serial number 85458563. The Big “W” and The Milkman’s Matinee are pending trademarks filed with the USTPO serial number 85452733 and 85895276 respectively. WNEW-AM® is a registered trademark in the European Union serial number 010186518. The WNEW Thematic musical bumper is a trademark of Metropolitan Broadcasters LLC. Site Login| Created by inGauge, Inc.